These courses are taken on a 500cc motorcycle. All our 500cc motorcycles have gears. Passing the test will give you an ‘A2’ motorcycle licence which allows you to ride any machine of up to 35Kw (46.6bhp) without ‘L’ plates and to carry a passenger. The practical test is in two parts – Module 1 and Module 2. You need to pass them in order. You will need to be age 19 or over. 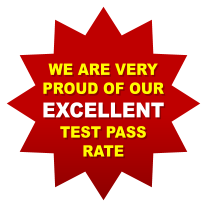 If you have not passed the A1 test you will need to hold a valid CBT certificate and have a valid motorcycle theory test pass. If you do not hold a valid CBT certificate, then you will have to complete a CBT first on day 1 of your course. The theory can be arranged by ringing 0300 200 1122 or by visiting link on the right. Flexibility: As the course fee is charged at a daily rate you can choose your options. You can take CBT followed by both modules within consecutive days, gaining a full licence in one visit, or split your days to suit, i.e. take CBT and Module 1 initially to be followed later by Module 2. We are totally flexible and can arrange your course to suit you. Our experienced office staff will help you with booking your course. This consists of a series of manoeuvres that are conducted at the DSA Multi Purpose Test Centre. Some of these are at slow speeds, (such as a slalom and a U-Turn), and some at higher speeds, (including a 50km, (about 32 mph) avoidance manoeuvre), which require a good standard of machine handling skills. Fortunately at the Bristol Motorcycle Training Centre we have a Module 1 test circuit permanently laid out for you to train on. We also use a speed gun to aid training. After completing your Module 1 training you will be fully prepared for your test and your instructor will accompany you to the local MPTC to take the Module 1 practical test. This test consists of a 40 minute road ride. At the start of the test the examiner will brief you. You will have an eye-sight test and be asked a number of safety questions before being given a final briefing. The rest of the test will be conducted on the road. Module 2 training will totally prepare you for all aspects of the test and will be conducted on the road. The training will culminate in your instructor taking you to the local MPTC to take the Module 2 practical test. 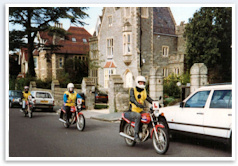 The fees for Module 1 & Module 2 training are £155.00 per day after achieving CBT which includes training, motorcycle, equipment, tax and insurance, fuel with no hidden extras. * After 2 years or on reaching 24 years of age you can take a Full Category A Motorcycle Test to ride whatever machine you like. All design and content copyright © Bristol Motorcycle Training Centre unless otherwise stated. All rights reserved.